Unicorn Cupcakes are such a fun way to celebrate a birthday! 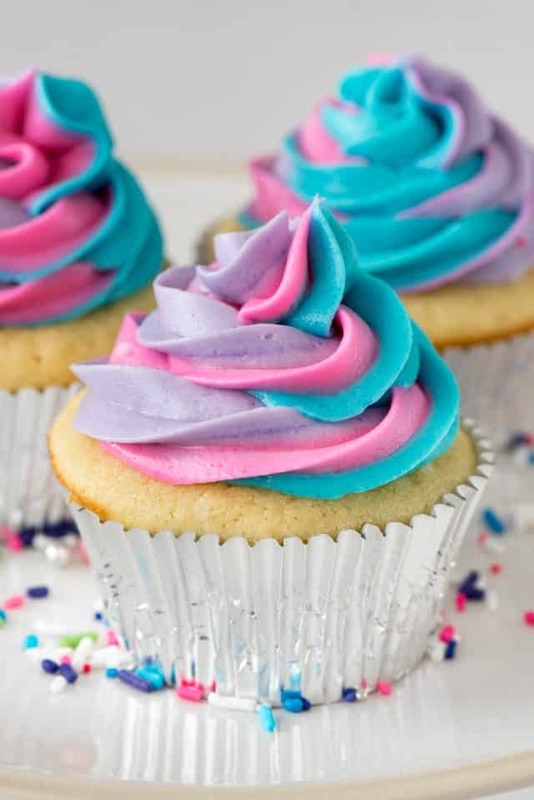 Fill vanilla cupcakes with sprinkles and top with a swirled colorful frosting. Kids and adults will love this easy cupcake recipe! Have you ever wondered how to create a swirl frosting effect? 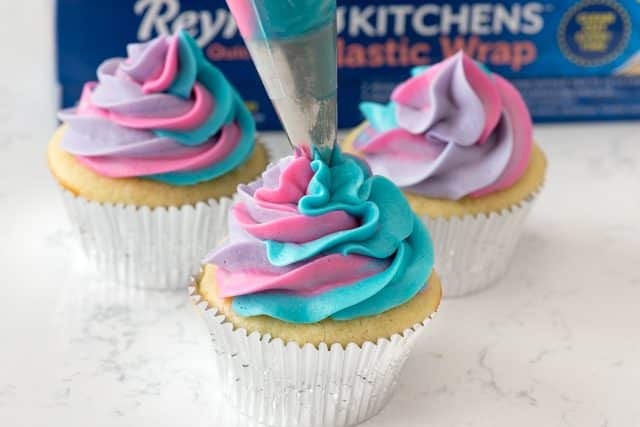 As a Reynolds Ambassador, I’m excited to show you a plastic wrap hack that’s going to change the way you frost cupcakes! I have a huge love of all things sprinkles and unicorns. In fact, my 40th birthday party was a rainbow unicorn sprinkle party and these Unicorn Cupcakes would have fit right in. I don’t know why I love unicorns and glitter and rainbows so much. Maybe because they represent happiness? Or fantasyland? Where a unicorn is involved, nothing can go wrong, right? Plus, sprinkles are pretty and rainbows are pretty and unicorns are…pretty. Is anyone else as infatuated by unicorn food as me? I love searching on Pinterest and just scrolling and seeing the unicorn cupcakes and cookies, the unicorn cake roll and hot chocolate and bark recipes…and so many more. In my opinion, you don’t need an occasion to make a unicorn cupcake, but these would be perfect for a birthday or a fun spring or summer party. Any kid loves a colorful frosting…and if any adult is like me they love it too. In my mind unicorn cupcakes don’t look like unicorns, but rather, they have unicorn properties. After all, if a cupcake looks like a unicorn that means you’re eating a unicorn and, well, that’s anti-magical or something. So, how do I make a unicorn cupcake? I think a unicorn cupcake has to have a colorful swirled frosting and lots of sprinkles. For these cupcakes I let the swirled frosting be the star of the outside of the cupcake and made the sprinkles the star of the inside! Have you ever seen a piñata cupcake? These are kind of like that, but they spill unicorn love all over instead of candy. I started this cupcake recipe with my perfect yellow cupcakes. Of course, you can use a box mix, but with my recipe you get 24 perfect cupcakes and never need to use a box again! If your unicorn lover is a chocolate lover, then by all means, use my favorite chocolate cupcake recipe instead. I used my own special mix of unicorn sprinkles, which is to say I raided my sprinkle cabinet and mixed a bunch together. Pick out some rainbow jimmies, pastel nonpareils and throw in some pink or blue pearls and you’re good to go! Simply hollow out part of the center of the cupcake and fill it with the sprinkles. Then replace the cupcake piece. The fact that I left the cupcakes natural makes these easy unicorn cupcakes, and they’re a recipe anyone can make. These would even be fun for kids to decorate at a party. Once you have the cupcakes filled, it’s time to frost them with a colorful frosting swirl. How do you swirl frosting on cupcakes? Don’t worry, it’s easy, with this genius plastic wrap hack. I started with Reynolds Kitchens Quick Cut Plastic Wrap. This is such an amazing product to begin with, because it comes with a slide cutter built in. All you have to do is open the box and start using the plastic wrap, no confusing assembly necessary. 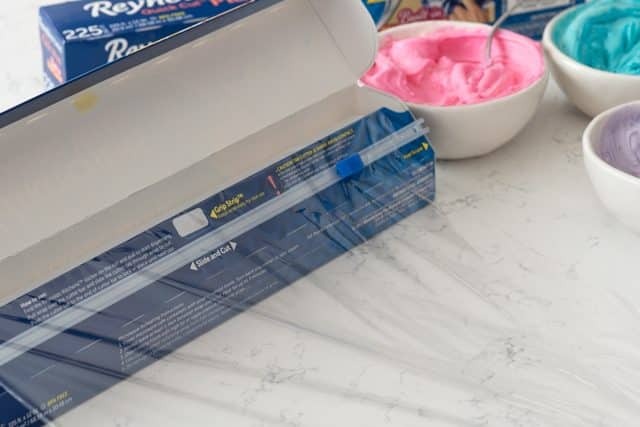 If you’ve ever been frustrated with plastic wrap, the Reynolds Kitchens Quick Cut Plastic Wrap will eliminate your plastic wrap headaches for good. The slider keeps the roll in place and also means that it’ll be a clean cut every time, without the plastic wrap bunching up on itself. It’s also the key to making the perfect swirled frosting! Lay out a sheet of plastic wrap on the counter. Add one of your colorful frosting colors to the center. Roll it up like a log and twist the ends. Repeat for the remaining colors. Cut off one end of each log. Place the logs together, cut side first, into a pastry bag fitted with your desired tip (I used a 1M). See how easy and pretty that is? Perfectly swirled frosting, every time. I’ve been using Reynolds products my entire life, from their foil to plastic wrap to slow cooker liners and cooking bags, so I know what I’m talking about when I say that the Quick Cut Plastic Wrap is pretty much the best invention ever. Except for maybe unicorn cupcakes…those are pretty cool too. Make frosting: beat butter until creamy using a hand or a stand mixer. Slowly mix in powdered sugar, 1 cup at a time. Add salt and vanilla, then add 2 tablespoons of heavy whipping cream. Beat at medium high speed until smooth, adding more cream as needed for desired consistency. Divide the frosting into 3 bowls. Color each a different color: pink, blue, purple. 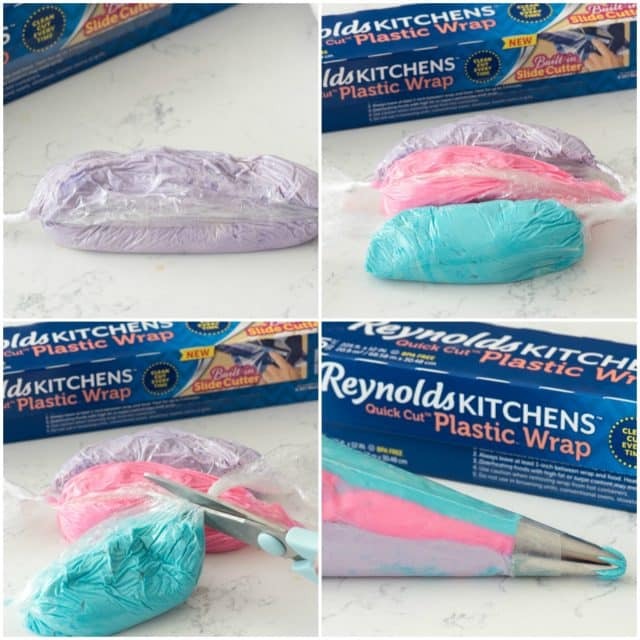 Reynolds Kitchens Plastic Wrap Hack: lay out a piece of plastic wrap. Place one color frosting in the center and roll up like a log, squeezing the air out. Twist the ends to seal. Repeat with remaining colors of frosting. Cut of one tip of each plastic frosting log. Place all three, cut side first, into a large plastic pastry bag fitted with a 1M tip (or other desired tip). Prepare the cupcakes: cut a small hole in the center of the cupcake and remove the piece of cupcake. 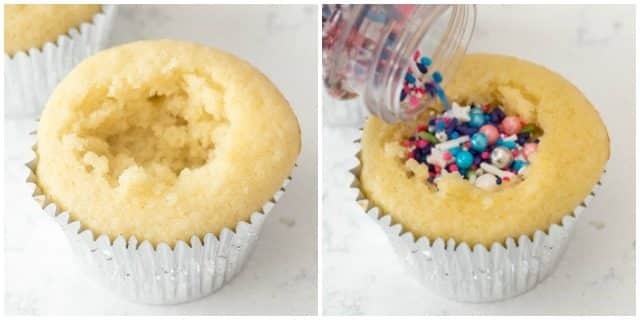 Fill the hole with sprinkles, then replace the bit of cupcake. Frost cupcakes with the swirl frosting. Top with additional sprinkles, if desired. Store in an airtight container in refrigerator for up to 4 days. 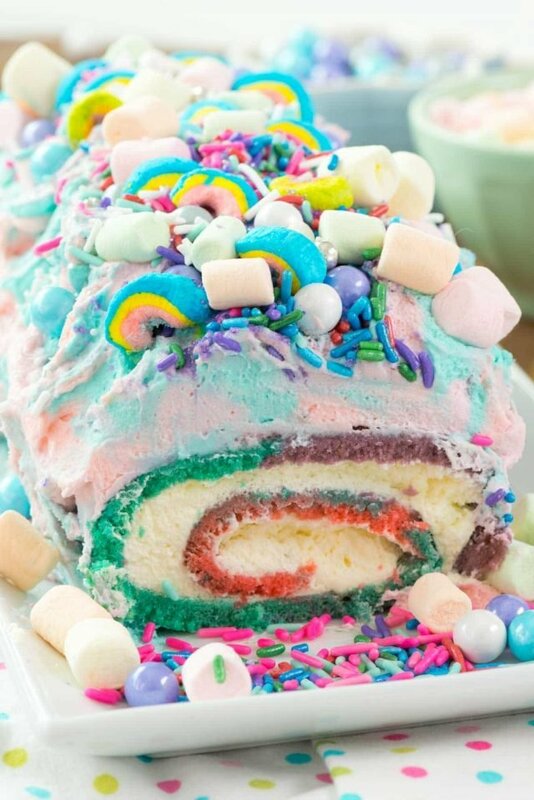 Unicorn Cake Roll is a fun birthday cake! 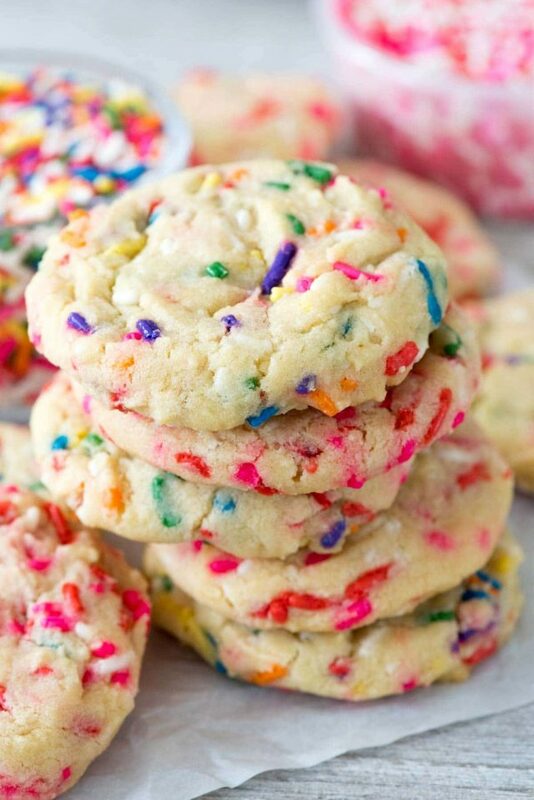 Sprinkle Cookies are so fun! 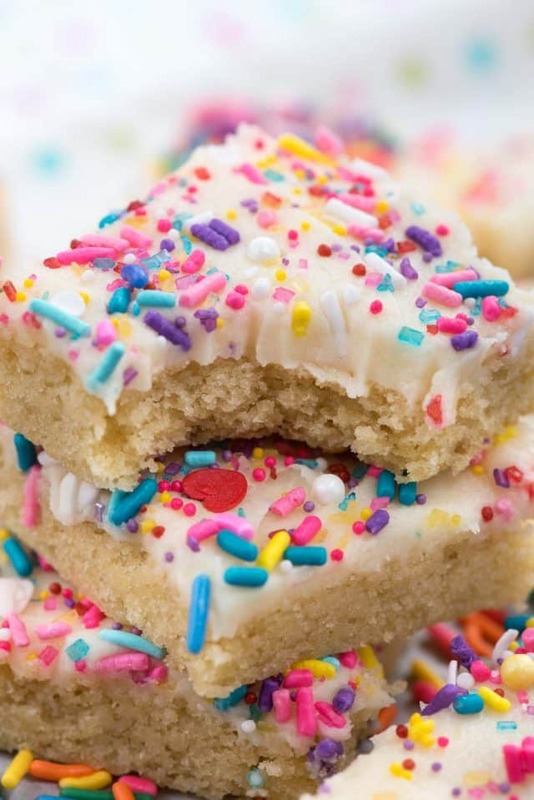 Sugar Cookie Bars are easy to decorate with unicorn sprinkles! This post has been sponsored by Reynolds. All opinions are 100% my own. OMG. This is exactly what I needed today. Thank you, Dorothy, for making me smile. Yes, a cupcake brimming with sprinkles and full of colorful delight just made my day. Not to mention that Unicorn Cake Roll! Now that is spectacular. Thank you for sharing. Such simple things can truly brighten the day. It’s like taking a trip to My Little Pony Land Heaven. Yeah! I love the way you swirled the frosting. These look sooooo goooood! I also don’t know why I like unicorn, maybe because the color of anything unicorn related is so beautiful! I love colorful things. Thank you for sharing the recipe! wow, the ice cream looks delicious, i also want to try it. Thank you for this recipe! 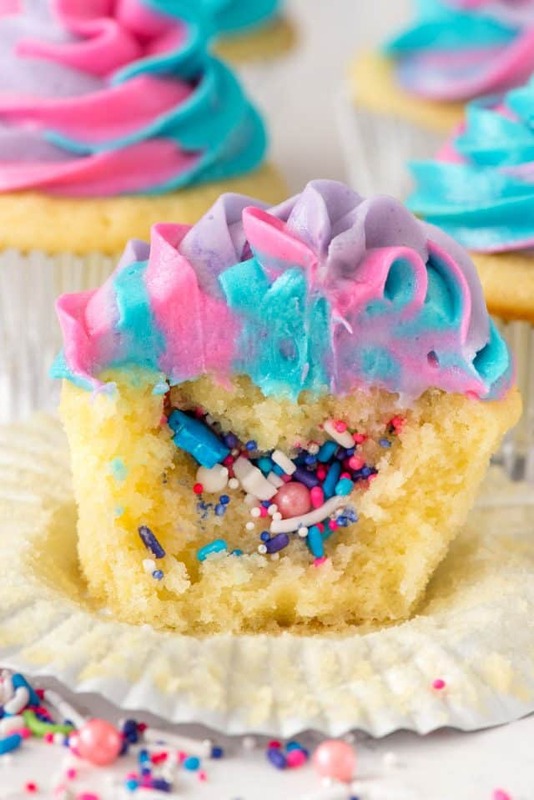 My daughter wanted Unicorn Cupcakes and this exactly the foolproof recipe I was looking for! They turned out great! !